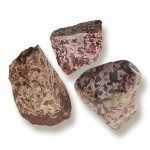 Jaspers is called an ornamental rock. It is an opaque and fine grained variety, composed mostly of Chalcedony, microcrystalline Quartz. It is found in almost all colors. Found World Wide: India, Russia, France, Germany, & US. 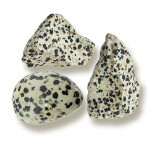 Jasper is derived from the Greek for “spotted stone”. 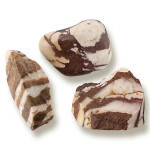 Jasper is usually considered a chalcedony, but put by scientists in a group by itself because of its grainy structure. The finely grained, dense jasper contains up to twenty percent foreign materials that determine its color, streak and appearance. Uniform jasper is rare. It usually is multicolored, striped spotted or flamed. Some of the most treasured gems are those that show a picture that appears to be taken from nature, called “landscapes”. 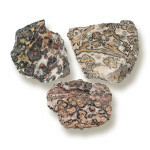 Oregon’s Biggs Jasper is now the most common source. 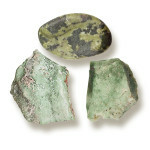 ”Bruneau Jasper”, from Bruneau Canyon, Idaho, is praised for its blue “skies”. 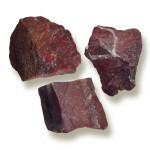 Another specialty is bloodstone or blood jasper, also known as “heliotrope”, a dark green chalcedony or jasper with flecks of red. 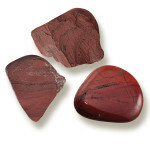 Bloodstone is the Zodiac birthstone for Aries. 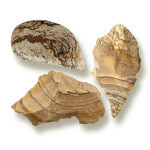 - Scenic jasper: Brown marking caused by iron oxide, resembling a landscape.